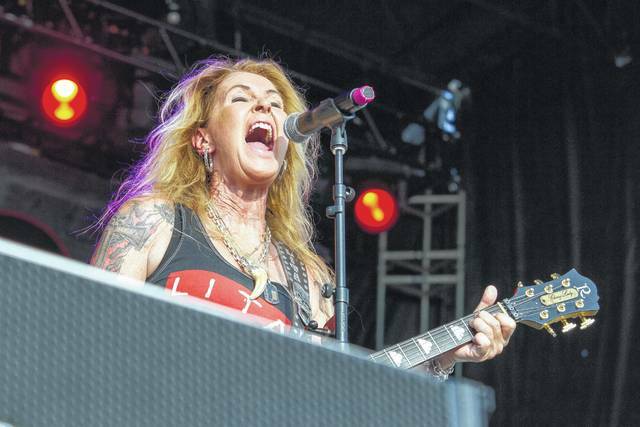 Lita Ford sings and plays guitar during her performance Saturday evening at the Loud-N-Lima music festival. LIMA — The first Loud-N-Lima rock concert continued through Saturday at the Allen County Fairgrounds and the acts left many people happy, despite the mud, sun and heat. The Allen County Fairgrounds were full of vendors selling a wide variety of food: Pizza, burgers and the usual fairground event staple, funnel cakes. There were a couple of vendor tents selling different rock ‘n’ roll related items. There was also a Budweiser tent selling beer to the wide assortment of rock ‘n’ roll fans. People from all over Ohio came to Loud-N-Lima on Saturday to see artists such as Lita Ford, Cinderella, and the main event of the day, Bret Michaels. A wide assortment of people were in attendance. People who grew up with bands such as Poison and The Runaways mingled with people who discovered those artists decades later. Zak Morgan, of Cincinnati, was in town on business and met up with some friends at the concert, he said. He didn’t come for any one act but he left with Dee Snider’s act Friday night on his mind. Snider played the song “We’re not gonna take it,” but turned it into an anthem against terrorism, during his act Friday, Morgan said. Morgan said if Lima ever holds another Loud-N-Lima event he will definitely be back for it. Tom Farley, of Spencerville, said he came to see Cinderella, but they ended up canceling their appearance. Renee and Joe Swartz, of Bucyrus, came to Loud-N-Lima specifically to see Ford in concert. Renee and Joe Swartz both agreed that seeing Ford in concert was everything they hoped it would be. Loud-N-Lima finishes Sunday with performances from Brown and PJ Farley, Troy, Love N Revenge and Vince Neil.